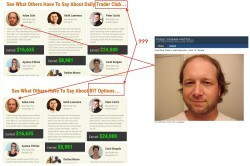 Gilbert Says that the Daily Trader Club is a binary options trading app with a 87% success rate. So it allegedly made him a lot of money, among other things he could buy 11 houses. Gilbert is now giving access to his app for free. Allegedly for a limited number of people. Let’s start with the fake counter, on the Daily Trader Club web site you’ll see a countdown, but once it is at zero, it starts again at 10 minutes. So it is clear, a fake tool to put you under pressure and make you act fast without thinking. Gilbert is in reality a fictitious character that has been used also in the Bit Options scam. 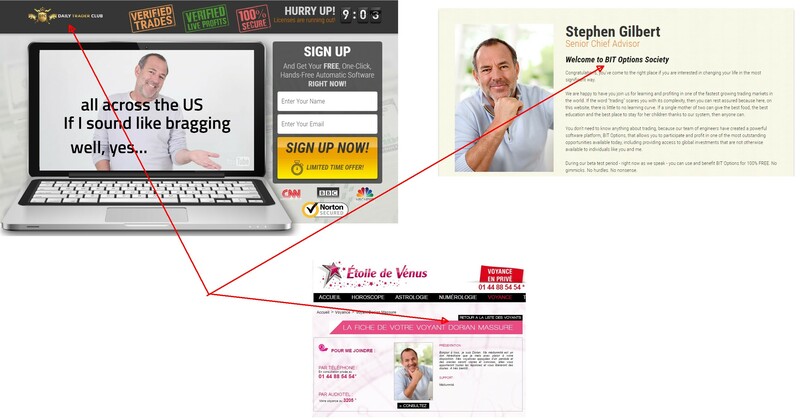 Both scams have the same web page, but the title is different and the presentation videos are slightly different too. 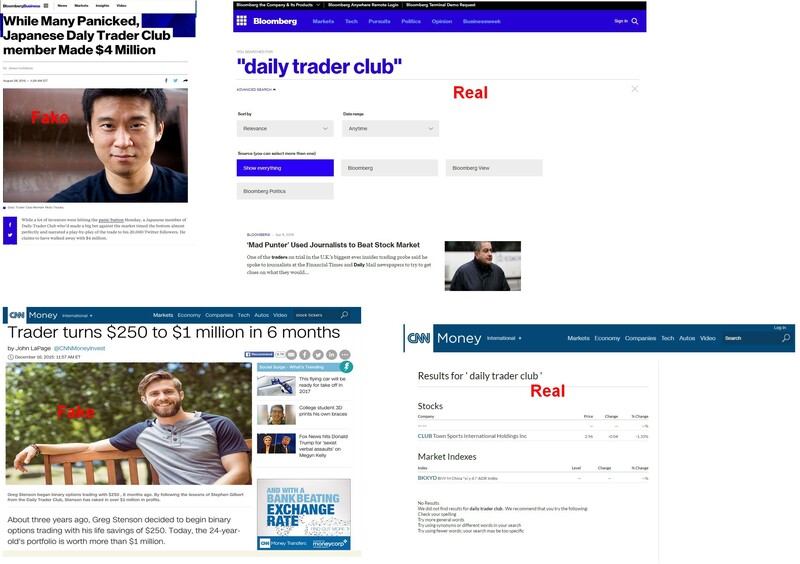 But this way they provide the best proof that Daily Trader Club and Bit Options are the same scam. They use the same testimonials, but for seemingly different products. Photos, names and stories are the same, but the endorsed product has a different name. 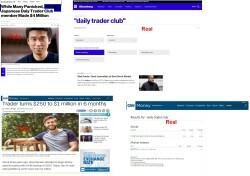 On the Daily Trader Club web site you can see some articles from media like Bloomberg or CNN. But the pictures are fake, these articles were never published, you can verify it by doing your own research on these web sites. Or take a look at the image on the right for a few examples. 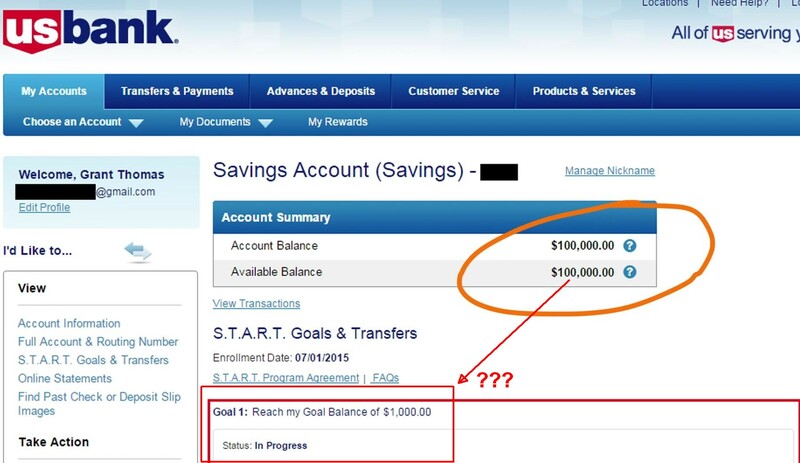 In the videos of these scams you can also see some bank account statements that should prove that Daily Trader Club and Bit Options are really making money. But they are fake too. Look at the picture on right, this is the proof that the balance has been faked. We believe that the Daily Trader Club and Bit Options app have the same core. In any case you will first have to deposit at least $250 in order to be allowed to use them. So no testing, you’ll have to immediately trade live, which is extremely dangerous. If you do it, you can be sure that you will lose your deposit. So these systems are really not free, you’ll be losing your real money. 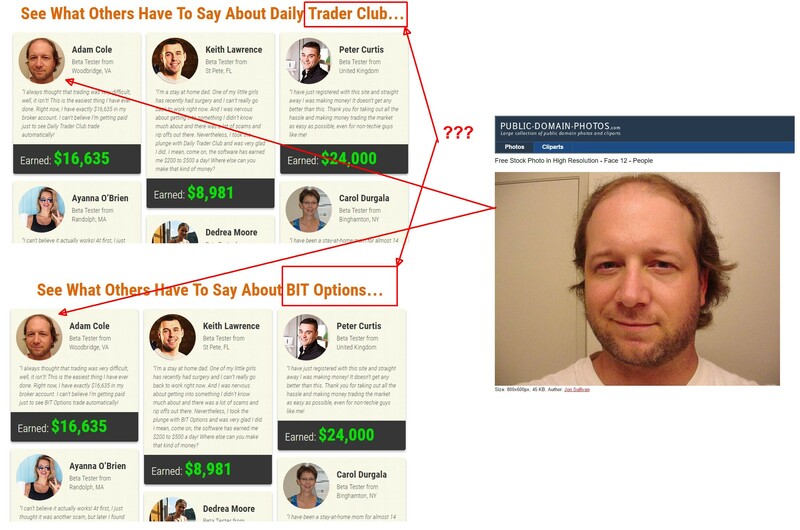 Daily Trader Club and Bit Options are the same binary options scam that will lose your money, so don’t use them. If you are interested in trying binary options risk free to see how money can be made in trading, do it on a demo account. Binary options are easy to understand, but you still need a strategy in order to make profits.